BAKU (RFE/RL)–Turkey will not give in to international pressure to end its economic blockade of Armenia–Turkish Minister of State Resat Dogru said Monday on a visit to the former Soviet republic of Azerbaijan. The border has been closed for more than a decade and all direct official trade links were severed but Turkey is now under pressure to resume economic ties with Armenia if it is to join the European Union (EU). "No international organization–including the EU–can force Turkey to open its borders with Armenia," Dogru said at a meeting with Azerbaijan’s President Heydar Aliev. 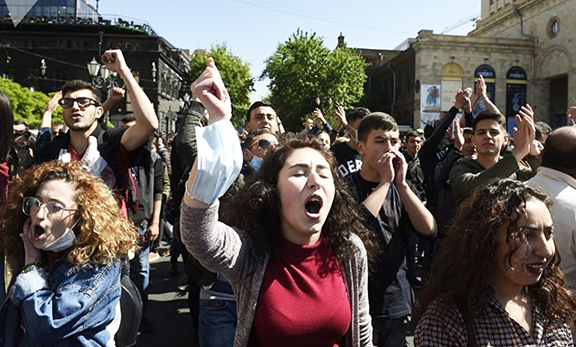 Turkey mounted the economic blockade partly out of solidarity with its ally Azerbaijan–which claims Armenia illegally annexed Nagorno Karabakh in a war in the early 1990s. Dogru–the cabinet minister responsible for links with Turkic-speaking countries–admitted that some private Turkish businessmen were trading with Armenia–but he said that there were "no contacts on a state level." Turkish businessmen visiting Yerevan–the capital of Armenia–Monday called for the frontier with Armenia to be opened to trade links despite political differences. "Our aim is to establish economic and trade links with Armenia–so it is indispensable to open the frontier between the two countries," said Tayar Oral–chairman of the chamber of commerce of the eastern Turkish region of Igdir. A 30-strong Turkish business delegation spent Monday in talks with Armenian business circles in Yerevan after traveling via neighboring Georgia. They said the roundabout route took them a day instead of two hours if the frontier with Armenia were open. Oral told a press conference eastern Turkish citizens would benefit greatly from the reopening of the border. "They are very far from the big Turkish cities–whereas Armenia is very close," he noted. Turkish business circles have repeatedly appealed to their government to reopen the frontier–he said. Meanwhile trade between Armenia and Turkey is routed through Georgia. According to official figures–Armenia imports some $40 to $45 million worth of building materials–foodstuffs and clothing–from Turkey annually–while Turkey imports between one million and $1.5 million worth of leather and metals from Armenia. Experts in Yerevan estimate that bilateral trade could rise to between $300 million and $400 million a year if the frontier were opened. "No international organization–including the European Union will ever be able to persuade Turkey to open its borders with Armenia until Armenia withdraws its troops from occupied Azeri lands and refuses its claims for international recognition of the 1915 Armenian genocide," the minister said.